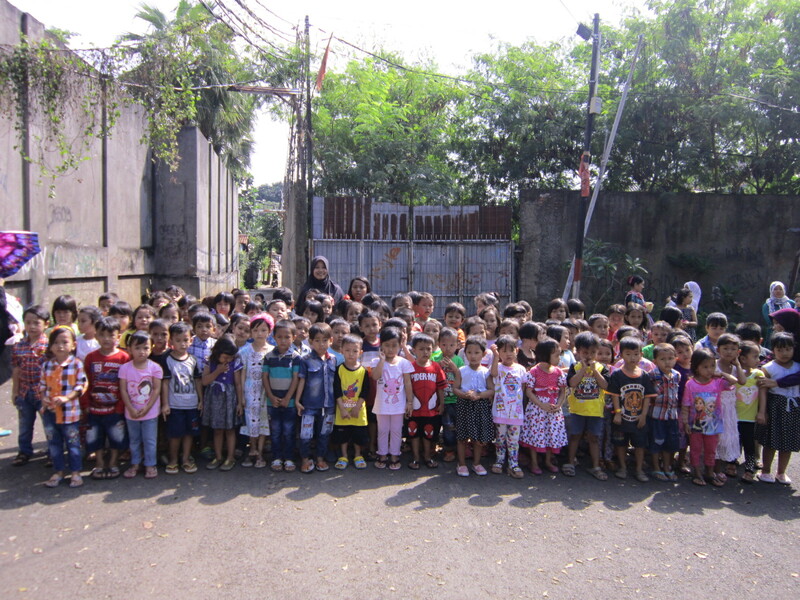 Yayasan Kampung Kids was formed by a group of Expatriate and Indonesian citizens in November 1999. The idea sprang from the expatriates of one founder, aid worker Mrs. Jane Lewis, who moved to a house in the heart of Kampung Pejaten Barat, South Jakarta in January 1997. Her young son, Harry, began to share his spacious front garden with many local children. Soon after, Jane’s family began providing soup and fruit for the son’s little friends every Thursday night, which became known as “Soup Night”. The number of children quickly grew from 10 to 30 regulars. Mrs. Jane Lewis realized that many more children in the Kampung needed better nutrition. She joined some friends to begin a pilot project called “The Pejaten Barat soup kitchen”, which legally became Yayasan Kampung Kids on November 7th, 1999. Our mission and vision is to give poor families a real chance to create a better future. We run various Health Programs from our community Center for children, mothers (specifically on the Birth Control) and elderly. We believe it all starts with a good health and nutritional status: if a child is sick often or malnourished, his ability to learn is reduced. Obviously this will affect their chances to find a job and make a good living in the future. Dr. Tati & Dr. Mimi Suharti volunteer doctors from the University of Indonesia, hold a weekly clinic at the community center together with a community health worker, it runs every Monday afternoon. This clinic has grown with around 263 children and students join, if the volunteer doctors find child or student who malnourished, they will refer the child/student to our special feeding program and give counseling to these mothers about nutrition. The clinic also provides diagnoses and basic medicines, vitamins, de-worming pills and referral to other local doctors. At the moment we have one child who needs extra medical care. His name is Ahmad Fajar who goes to Fatmawati hospital every Wednesday to have physical Therapy as he has cerebral palsy. We have been running Family Planning Program since we started but since March 2004, Kampung Kids in cooperation with the BKKBN, a Government Organization that provides free birth control such as pills, injection, IUD’s and implant. The Local Health Care Center helps us out by sending a nurse and counselors to run this clinic. We run this clinic every Wednesday morning and there are 181 ladies who actively taking the benefit from this program. If we calculated since we started this program, there are already 603 ladies who had joined this program and some of them still joining; this happened as some ladies already got menopause and move to another place. At least we have encouraged them to use the birth control in the beginning. It is a big different if we compare when we started in 2001, there were only 8 ladies wanted to join as they were too scare due the lack of knowledge of the birth control. We run clinic for the malnourished elderly once every month. There are 69 elders join with this program. We have two volunteer doctors run this program. The clinic refers these elders to have body exercises and counseling about the nutrition food. The clinic also provides diagnoses and basic medicine, vitamins and referral to other local doctors. Every elder would get a dry staple of rice, green beans, cooking oil and also they would get snack during the program. They are really happy to get involvement with our program and they don’t feel being neglected. We always have 50 students join with this program, this figure reduced in a few months as the status improved, allowing further students to join, this happened for many times now since we started in August 2006. We sponsors who provide cooked food daily from Monday through Saturday, they provide lunch for those students and the 50 students have to eat their lunch in Kampung Kids and we keep recorded with the absent. April 1st 2010, we start “Feeding Program” for the 73 Elders which run every Tuesday and Thursday afternoon. These “senior” have their meal in Kampung Kids building, these “senior” also have physical exercise every Tuesday. Starting October 2011, we start to feed 130 students in Bekasi. These students used to study with empty stomach but since we started the feeding program, we feed them early in the morning from Monday through Saturday. The teachers said that there are some significant different from the academic achievement of these students since then. Playgroup provides educational play, essential for cognitive development, to 140 preschool children. The groups also reduce the amount of time these children spend around canals and garbage dumps. All playgroups are run by volunteers, Indonesian and Expatriate. We have 750 students in school – more than 250 students who already graduated from senior high school to this date. These students are all individual sponsored by private people and organizations, schools and companies. Sponsors receive semester school reports and updates on their particular sponsored child. We provide a total entry package for all or our students. Each child on the scheme receives 5 sets of school uniforms as local schools have different colors every day and some other school supplies. Enthusiastic local volunteers run a variety of tutor classes for our primary students. Many of the parents of these students are illiterate of the home situation is not easy for home study. Our student volunteers help with exam preparation to get into the year levels. Volunteer teachers provide weekly classes run for around 97 students between the age of 5 – 15 years in 9 classes. The students are tested, given homework & expected to show good progress. We run 3 computer classes for 23 students which run by volunteers. These classes provide additional skill, greater self – esteem and greater job opportunities in their future life. Kampung Kids are really happy to get 7 new computers from two women’s association last few months, so we are looking for more volunteers to help our students in computer skill. We also have wireless internet to teach the students with internet knowledge. We have been running Pre – School Program for children who are between 4 – 6 years old. We have around 105 students joining with this program. Instead of sending these students to kindergarten which is very expensive, we hire two teachers (one fulltime and another is part time) to teach these children reading, writing and calculating. This program works well as last July 2014, there were round 30 students from Kampung Kids could enter government elementary school, they passed the test. We are going to register around another 30 children to elementary school at the end of June 2015 and hopefully all children will pass the test and ready to start to the formal studying.